4 fantastically fun games together in one exciting bundle! 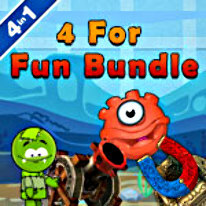 The 4 for Fun Bundle brings together four thrilling games together for the first time in one package! In the wacky puzzle game Sticky Linky, you match globs to create new creatures and save them from being eaten by a super hungry fish! Goblin Defenders: Steel 'n' Wood is a challenging tower defense game in which your survival depends on your ability to effectively upgrade your weapons and defeat the oncoming hordes of ogres, spiders and evil spirits! In the physics-based puzzler, Lost Head, you must reunite poor Franken-Stitch with his head! Help him reclaim his noggin by using realistic physics and interactive objects in 72 exciting levels! Slingshot Puzzle is the ULTIMATE arcade puzzle challenge. Draw back your crossbow, unleash your ball and sink it in the hole in this thrilling combination of pinball and golf!